Biological Identification provides a detailed review of, and potential future developments in, the technologies available to counter the threats to life and health posed by natural pathogens, toxins, and bioterrorism agents. Biological identification systems must be fast, accurate, reliable, and easy to use. It is also important to employ the most suitable technology in dealing with any particular threat. This book covers the fundamentals of these vital systems and lays out possible advances in the technology. Part one covers the essentials of DNA and RNA sequencing for the identification of pathogens, including next generation sequencing (NGS), polymerase chain reaction (PCR) methods, isothermal amplification, and bead array technologies. Part two addresses a variety of approaches to making identification systems portable, tackling the special requirements of smaller, mobile systems in fluid movement, power usage, and sample preparation. Part three focuses on a range of optical methods and their advantages. Finally, part four describes a unique approach to sample preparation and a promising approach to identification using mass spectroscopy. 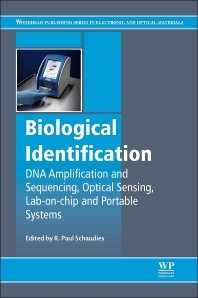 Biological Identification is a useful resource for academics and engineers involved in the microelectronics and sensors industry, and for companies, medical organizations and military bodies looking for biodetection solutions. Biological Identification is a useful resource for academics and engineers involved in the microelectronics and sensors industry, and for companies, medical organisations and military bodies looking for biodetection solutions. R. Paul Schaudies is the president and chief executive officer of GenArraytion. He served as scientific advisor to the EPA during the Anthrax incident in Washington D.C. and served on a dozen National Research Council committees due to his expertise in bio- and nanotechnology. He has also held research posts in the US Army, and is an author of several papers and reports on biological identification.